Voices for Vaccines releases new podcast: "Hashtag Vaccines–The Social Media Episode"
IAC updates "Don't Be Guilty of These Preventable Errors in Vaccine Storage and Handling!" and "Checklist for Safe Vaccine Storage and Handling"
IAC revises "Vaccines with Diluents: How to Use Them"
IAC updates its vaccination record for medical charts, "Vaccine Administration Record for Adults"
CDC, U.S. Department of Agriculture, and 4-H develop free 60-page comic book-style story called “The Junior Disease Detectives: Operation Outbreak"
A: Shingrix is the preferred shingles vaccine. You and patients should make every effort to ensure that two doses are administered within the recommended interval. If more than 6 months have elapsed since the first dose, administer the second dose when possible. Do not restart the vaccine series, and do not substitute Zostavax (zoster vaccine live) for the second dose of Shingrix. If you are out of Shingrix and a patient needs a second dose, the Vaccine Finder may be helpful for patients to locate other providers that have Shingrix. CDC still recommends Zostavax for healthy adults 60 years and older to prevent shingles. This shingles vaccine may be used in certain cases, such as when a person prefers Zostavax or requests immediate vaccination and Shingrix is unavailable. Patients who have received Zostavax are recommended to subsequently receive Shingrix. Age and time since receipt of Zostavax may be considered to determine when to vaccinate with Shingrix (minimum interval of 8 weeks). Access all the Q&As on CDC's Frequently Asked Questions About Shingrix web page. Every year in August, National Immunization Awareness Month (NIAM) provides an opportunity to raise awareness of the importance of immunization and the need for improving national vaccination coverage levels. NIAM is co-sponsored by the National Public Health Information Coalition (NPHIC) and CDC. The upcoming week, August 12–18, focuses on vaccinations for babies and young children. The theme for the week is "A healthy start begins with on-time vaccinations." IAC's Video of the Week has been an engaging and informative feature on the home page of immunize.org since 2009, with a new video appearing every Monday. The videos present personal stories, news, animations, and other types of immunization-related video clips. In addition to appearing on the home page, it also appears every week in IAC Express in the right-hand column. Readers can explore the Video of the Week archive dating back to 2009 to see all previous videos. Note: Four of these institutions qualified for multiple 12-month periods at one time. The Honor Roll now includes 412 birthing institutions from 40 states, Puerto Rico, Guam, and an overseas U.S. military base. Ninety-one institutions have qualified for two years, 47 institutions have qualified three times, 19 institutions have qualified four times, six institutions have qualified five times, one institution has qualified six times, and one institution has qualified seven times. Voices for Vaccines (VFV) has posted a new entry in its Vax Talk podcast series: Hashtag Vaccines–The Social Media Episode. In this podcast, Karen Ernst, Voices for Vaccines, and Dr. Nathan Boonstra, Blank Children's Hospital, talk to Dr. Jen Golbeck, director of the Social Intelligence Lab at the University of Maryland, College Park, about the negative aspects of social media (e.g., echo chambers, misinformation, and conspiracy theories) that pro-vaccine advocates have to fight daily. IAC recently revised the following two resources for healthcare professionals to help with safe vaccine storage and handling. Don't Be Guilty of These Preventable Errors in Vaccine Storage and Handling! was revised to remove references to Menomune and to change the acronym for Zostavax to ZVL. Checklist for Safe Vaccine Storage and Handling was updated to ensure the text was in conformity with CDC's January 2018 Vaccine Storage & Handling Toolkit. IAC recently revised Vaccines with Diluents: How to Use Them to remove references to Menomune and to change the acronym for Zostavax to ZVL. IAC recently updated its vaccine storage and handling resource titled Emergency Response Worksheet. The worksheet help healthcare professionals properly deal with the aftermath of power failures and temperature excursions. Changes were made to update contact information for the vaccine manufacturers listed on the handout. IAC updated its Vaccine Administration Record for Adults to add Shingrix (RZV) to the zoster vaccine options and Heplisav-B to the hepatitis B vaccine options. Additionally, the example pages that demonstrate how to use the vaccine administration record were updated as well. This two-page vaccine administration record is designed for paper medical charts and includes columns for all required information. Providers can also print out and save the completed example pages to help staff correctly use this resource. CDC published Progress Toward Poliomyelitis Eradication—Afghanistan, January 2017–May 2018 in the August 3 issue of MMWR (pages 833–837). On the same day, WHO's Weekly Epidemiological Record published a similar article titled Progress towards poliomyelitis eradication in Afghanistan, January 2017–May 2018. A media summary of the MMWR article is reprinted below. To achieve wild polio virus type 1 (WPV1) eradication, Afghanistan and global partners must continue to maintain and regain access for supplementary immunization activities (SIAs) in security-challenged areas, strengthen oversight of SIAs in accessible areas to reduce the number of missed children, and coordinate with authorities in Pakistan to track and vaccinate high-risk mobile populations in their shared transit corridors. In 2017, fourteen WPV1 cases were confirmed in Afghanistan, compared with 13 in 2016. From January–May 2018, eight WPV1 cases were reported, which was twice the number of cases reported from January–May 2017. The number of polio-affected districts in Afghanistan increased from six in 2016 to 14 in 2017 (including WPV1 cases and positive environmental samples). Polio cases in 2018 have been limited to two regions bordering Pakistan known as the Southern and Northern corridors. We are making continued progress in reaching children everywhere and finding the virus where it persists. The novel follows a group of teenage 4-H members who participate in a state agricultural fair and later attend CDC’s Disease Detective Camp in Atlanta. 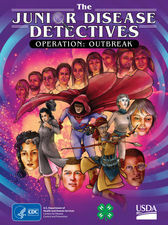 When one of the boys becomes sick following the fair, the rest of the group uses their newly acquired disease detective knowledge to help a team of public and animal health experts solve the mystery of how their friend became sick. The graphic novel is intended to raise awareness among youth about the potential human health risks associated with variant influenza virus infections, and it is also intended to inspire youth interest in careers in public and animal health. The release of the graphic novel is intended to coincide with agriculture fair season, which is occurring right now in the U.S.
Download this graphic novel at no charge from the Apple iTunes bookstore or download and print "Junior Disease Detectives" as a PDF document. CDC recently released the July issue of its monthly newsletter Immunization Works. The newsletter offers the immunization community information about current topics. The information is in the public domain and can be reproduced and circulated widely. On July 23, the American Journal of Preventive Medicine published Clinicians’ and Pharmacists’ Reported Implementation of Vaccination Practices for Adults (CS Lutz et al.). Sections of the abstract are reprinted below. Despite the proven effectiveness of immunization in preventing morbidity and mortality, adult vaccines remain underutilized. The objective of this study was to describe clinicians’ and pharmacists’ self-reported implementation of the Standards for Adult Immunization Practice (“the Standards”; i.e., routine assessment, recommendation, and administration/referral for needed vaccines, and documentation of administered vaccines, including in immunization information systems). Implementation of the Standards varied substantially by vaccine and provider type. For example, >80.0% of providers, including obstetrician/gynecologists and subspecialists, assessed for and recommended influenza vaccine. However, 24.3% of obstetrician/gynecologists and 48.9% of subspecialists did not stock influenza vaccine for administration. Although zoster vaccine was recommended by >89.0% of primary care providers, <58.0% stocked the vaccine; by contrast, 91.6% of pharmacists stocked zoster vaccine. Vaccine needs assessments, recommendations, and stocking/referrals also varied by provider type for pneumococcal; tetanus, diphtheria, acellular pertussis; tetanus diphtheria; human papillomavirus; and hepatitis B vaccines. This report highlights gaps in access to vaccines recommended for adults across the spectrum of provider specialties. Greater implementation of the Standards by all providers could improve adult vaccination rates in the U.S. by reducing missed opportunities to recommend vaccinations and either vaccinate or refer patients to vaccine providers. Access the complete article: Clinicians’ and Pharmacists’ Reported Implementation of Vaccination Practices for Adults. On August 1, the journal Vaccine published Influenza vaccine effectiveness in preventing influenza-associated intensive care admissions and attenuating severe disease among adults in New Zealand 2012–2015 online (Thompson MG, et al.). The study was a collaborative project with CDC, conducted through the Southern Hemisphere Influenza and Vaccine Effectiveness Research and Surveillance project. A section of a summary about the study from CDC is reprinted below. Access the abstract: Influenza vaccine effectiveness in preventing influenza-associated intensive care admissions and attenuating severe disease among adults in New Zealand 2012–2015. Access the complete CDC summary: Study Shows Flu Vaccine Reduces Risk of Severe Illness. The August 15 webinar will cover "Varicella/Zoster" and include a live Q&A session. Recordings of sessions will be available online within 2 weeks after each webinar. All sessions begin at 12:00 p.m. (ET). Continuing education will be available for each event. The 2018 World Influenza Conference will take place in Beijing on September 7–10. The meeting is sponsored collaboratively by the Asia-Pacific Alliance for the Control of Influenza (APACI), the Chinese Center for Disease Control and Prevention, the National Adult and Influenza Immunization Summit (NAIIS), and other global partners. More information is available on the APACI website. The registration fee will be waived for NAIIS partners. To obtain a passcode for registration, email lj.tan@immunize.org. As the number of seats available for international attendees will be limited to around 350, and the process for obtaining a visa for China can be complicated and protracted, anyone interested in attending should start making arrangements now. 2018 NFID Awards Dinner: Anne Schuchat, MD: Dr. Anne Schuchat, acting director of CDC with nearly three decades of CDC experience, accepted the 2018 John P. Utz Leadership Award from the National Foundation of Infectious Diseases. As she has done in other presentations to keep things upbeat, she sang about some of the issues and challenges that CDC has addressed recently.